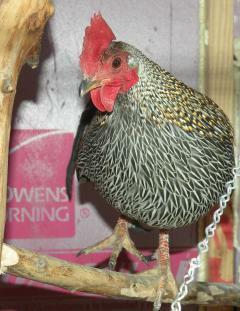 This my first Jungle Fowl, his name is Brutus I got him last spring. Like all jungle fowl he is very excitable and animated. 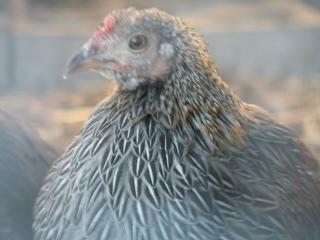 I also have two hens and an 8 month old chick (below). They seem to be doing well in our rather frigid Boise climate. My chicken coup is insulated and heated and I only let them into the run on days that are above freezing, although they appear to be unhampered by colder temperatures. Evidently jungle fowl can take more cold than they have been letting on. Accoding to other bird owners they can take freezing cold. Some have described feet and crops getting frost bite. Which would impossible for my chickens becuase they have convinced me that they are really tropical birds requiring a great deal of warmth. This is my first born (chicken that is) with his dad. One of my hens laid four eggs, three were fertilized, two hatched and one survived (above). I wasn’t sure of his gender. For several months I was convinced he was a hen. His color, patterns etc. 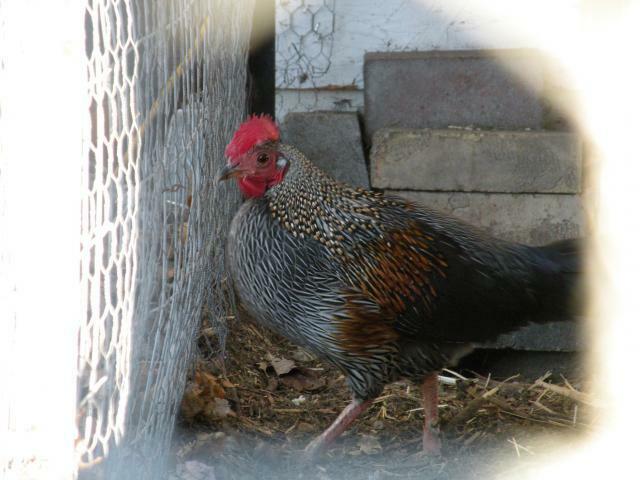 look just like the hens, then about Christmas time his color started changing. Now you can clearly see his neck and wing plumage changing. 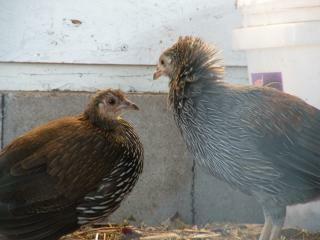 One of the two hens that I bought last spring laid, the other did not. It was interesting to see how well she sat and protected her nest. She would not move, not even a blink. After a day I actually got close enough to her to make her move (I wasn't sure she was alive). You would not believe how defensive she was of her eggs (a characteristic that carried over to her chick). She would puff up like I have seen roosters do, with neck and both wings flaring. Then she would attack. She was pretty frightening for such a small creature. She was very defensive of her chick for about six months, now he's just one of the flock. They have been sharing the coup with three domestic hens, but I keep them separated with a wire wall. I have put some of my domestic fowl in the jungle fowl chicken run for short periods of time to see how they would react with each other Their reaction to each other is consistant with other chickens that I have put together in the past. They don’t mix right away, but they don’t run from each other either. Then start to establish a pecking order like regular chickens with the domestic chickens getting the upper hand (I assume because the domestic chickens are bigger in size). I am leery of leaving them together because if the pecking order battle got out of hand it would be tough getting them sorted out. Usually I leave them in for about an hour while I watch and then give the domestics a chance to escape. My hope is to get them cohabitate so when I go on vacation I don’t have to put them in separate runs. I am playing with the idea of allowing them to mate, but not sure if there is a market for Araucanas with a wild streak to them. What do you think? These are very interesting chickens. I will be posting more information about these beautiful birds in the future. If you have questions please let me know. I'm new to this forum so I'm not sure how I get messages or how to respond to them, but I'll do the best that I can. 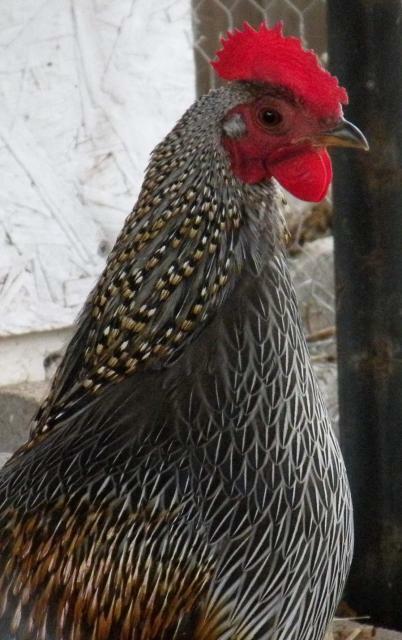 I raise grays, they are not at all different than raising game type chickens such as the cornish, kraienkoppe, phoenix, old english and leghorn breeds. As for the difference in reds and grays being heat. I've found through the years don't baby the birds or thier immune system wont fight dissease off well.I live in a Southern climate where the lows are not generally under 20 degrees. I have a 1500 watt cheap heater with an adjustable thermostat and set the shed at about 35-40 degrees(stays 35 at night and 40 during the day.I put up plastic on the walls for drafts.You may want to bump the temp up, I just leave it above freezing enough for the water not to freeze. I also use 5 -60 watt light bulbs at ground level , where they can bask when needed. They would not stay under them at night insisting to roost so I put a timer on them to turn off. Another alternative would be a small pen for each trio with a light in it as the heat source to keep the water thawwed and provide heat for the birds. Also provide a good electrolyte and vitamin supplement . Russell Super Vitamins works well. It can be put in the water at all times. These birds tend to suffer from a vitamin b-12 deffiency just as turkeys do. The supplement is a must. B-12 deffecieny usually leads to leg problems, uncontrolable weakness, disorientation and memory loss(in humans). Also try Russell Copper Sulfate it can be added to the water to prevent algea fungus and diseases(usually only needed in warmer months). I have used both items for 10 plus years continually and never had a bad result. Just remember when you sink money into a hobby , use a little preventative medicine to ensure your investment isn't lost. Get a good poultry disease book and buy antibiotics, wormers and insecticides before you encounter a problem so you will not be waiting 3-5 days for delivery while you are watching your flock diminish. If you have room for a chicken yard plant some winter time greens out there around late fall.This will give the birds initiative to get out of the shed and heat themselves up and at the same time they are injesting a high protien food sorce and saving you money. In summer I just sew bird seed in the yard, it grows some very nice annuals. In winter try winter rye grass, winter wheat, legumes (any clovers) collards or turnips. Any type of deer food plot seed intended for fall/winter at your local farm supply store will do just fine(these seed mixtures are generally much cheaper than buying the grains individually and are more nutritious than providing one or two seed types.. Just remeber to lyme and fertalize when you broadcast. I raise greens, grays and reds, useing these methods I have never lost an adult due to illness. Just keep them warm, provide them with adequate shelter and a good protien source (I like around 18%) and keep the rodent and predator population in check and you will do fine. There are a lot of qualities that a fly tier looks for in hackle, among them are color, size, thickness, stem, webbing, and length. I'll try to go through them the best I can. I do fish a little more than the average person and probably tie a little more, but this just my opinion. Color is dependent on the fly I tying. As mentioned in your article flies are intended to match a bug that the fish are eating. Just like you know better than to eat green bread, fish are not easily fooled by brown hackled blue-winged-olives. In the case of a grey jungle fowl, the prize feathers are those that are usually used to create the illusion of an eye, usually on a streamer type fly. Size is important. Getting the right size is important. If you went to the super market and there was an eight foot watermelon there, you might find it unbelievable. Fish are no different. The fish are not easily fooled by an imitation that is either too big of too small. Back in the day it was really hard to find small hackle and today I still pay a premium for small hackle (size 20-22). A newer phenomenon is that larger sized hackle (size 5-10) is getting hard to find because everyone is trying to breed the small stuff. Both neck and saddle hackle will vary from chicken to chicken and sometimes it will vary greatly on the same chicken. Personally, there are times that I prefer a hackle with a variety of sizes on the same chicken. For instance if I’m going to tie a caddis fly with brown hackle I’ll only want about 8 feather per size (8 size 12’s, 8 size 14’s, 8 size 16’s, and 8 size 18). In this case I want to buy a hackle that has all different sizes. On the other hand if I’m tying one of my favorite flies like the Renegade, I will tie up two or three dozen in size 16 and I would want a hackle that had only that size. Thickness of the hackle refers to the individual barbs on a feather. If you take a hackle feather and bend you will see what I mean. Typically the more individual barbs on the feather and the tighter they are the better. This way I don’t have wrap the hackle a bunch of times to get the affect I’m looking for. Think of the thickness in the way that men go bald: envision the mop of hair that an eight year old has in comparison to say Donald Trump. You don’t want Donald Trump Hackle. The stem of the hackle is very important. You want it to be both small and strong. It should be small so that it will wrap around the hook with the minimal amount of bulking up. When the hackle is wrapped around the hook the stem should be invisible. Likewise if the stems are too thin you loose strength, and nothing hurts more than to break your hackle off while trying to wrap it. Fly fishermen face this problem with lines that they use to tie the fly on with (known as tippets). If its too bulky the fish see it and it scares them off and if its too thin they catch the fish, but the fish breaks the line. Just the Goldie Locks, it has to be just right. The next two items are closely related: Webbing and Length. If you look at hackle feathers and bend them as you move your finger toward the skin, you will notice that the feather start getting very thick the closer you get to the chicken skin. This very thick part is called the webbing. Now forget what I said about thickness earlier…o.k. this type of thickness is not good for dry flies. What happens is the webbing when used on a dry fly actually absorbs water, turning your dry fly into a wet fly. Not good. The less webbing the better. Also it depends on how long the feathers are: I will be fine with a lot of webbing toward the base if the hackle is long enough to get a lot of flies out of it. Longer hackle feathers are good. There are other feature that make for a better hackle, one of the most important is how “waxy” the feathers are. 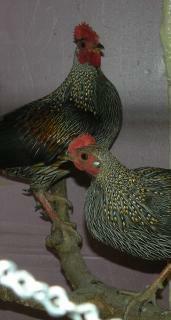 On the of the desirable characteristics of Grey Jungle Fowl is that their feathers are very waxy. This will prevent them from becoming water logged and will give that extra sparkle that fish like. This is also the reason that rooster feathers are used for dry flies and hens are used for wet flies. The rooster hackle actually repels the water while the hen feather tends to absorb it. Probably the best thing to do is to go a local fly shop and look at their hackle. Take it out of the bag and bend a few feathers. Look at the features I described and compare less expensive hackles to more expensive. Talk to your shop owner and ask his opinion. My guess is that you may have some hackle that he would be interested in and you might make a sale.